Lantern Festival ( read as Yuan Xiao in Chinese) is one of the three most important traditional festivals in the Chinese society ( the other two are Dragon Boat Festival and Mid Autumn Festival). It comes on the first full moon after Chinese New Year and the CNY is usually in the beginning of February. Lantern is the most common celebration in the festival. However, there are also other celebrations in different places, for example Flying Lantern Festival and Bombarding Handan Festival. Lord Handan is a deity of wealth. According to the legend, Lord Handan was afraid of cold. In order to keep warm for Lord Handan, people throw paper firecrackers toward him. 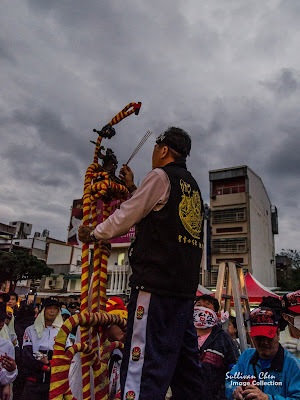 Nowadays, there are many places holding the rite of Bombarding Lord Handan, including Taitung, Kaoshung and Shinzu. And the festival in Taitung is the most famous one. The form of Bombarding Handan Festival is a little bit different in different places. In Taitung, 4 people carry the sedan chair and one or two warriors playing the role of Lord Handan stands on the sedan chair. The upper body of the warrior is naked. 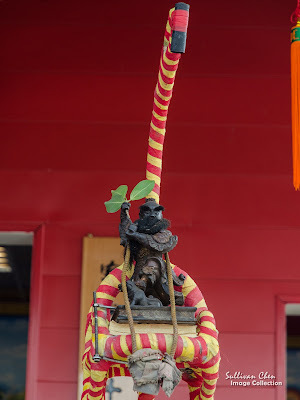 The warrior wears only red short trousers and holds a banyan branch to protect himself against firecrackers toward him. It is believed that the more firecrackers, the more fortune the folks can enjoy this year. In Taitung, there are about 20 sessions in 3 days of Bombarding, including afternoon and evening sessions . Most sessions are held in Nangking Square. Each session lasts about 30 minutes and there are about 3 rounds of bombarding in each session. The Taoist priest is in charge the whole rite. 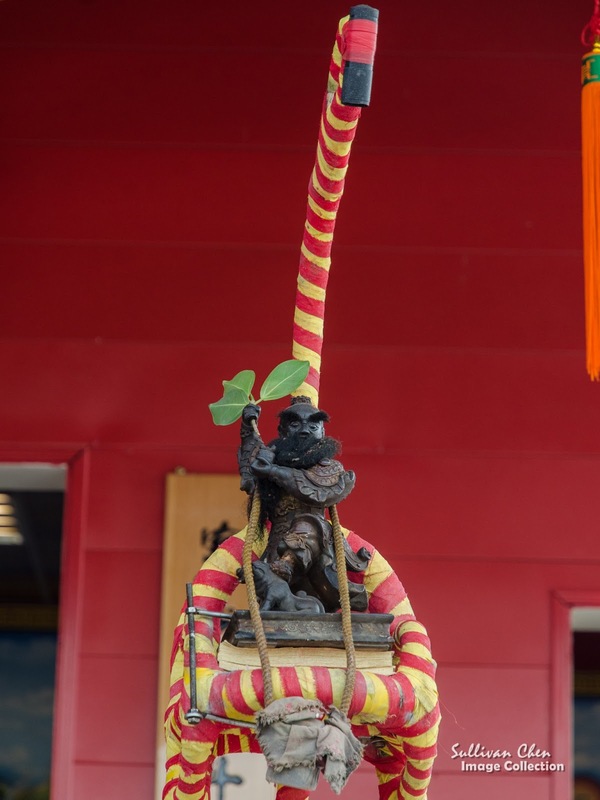 Before the rite, the stature of Lord Handan is already set on the top of the sedan. At the beginning of the rite. the Taoist priest will burn incense to report to Lord of Handan of the rite. The leaves on the hand of the the stature is banyan. Banyan plays an important role in Taoism. Taoism think banyan has special spirituality and uses its leaves and branches in many rites. The Taoist priest will pray for the warriors who play Lord Handan at the bombarding ceremony. 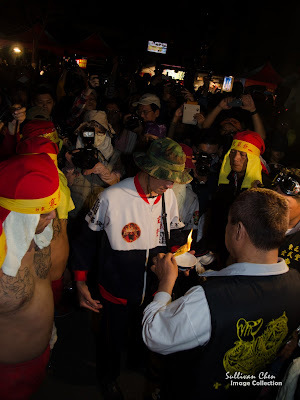 The Taoist priest speaks spell when burns the incantation,written with Taoist magic figures on a yellow rectangle paper, above a bow of clean water. He puts the ash of the incantation into the bow, meaning that he magic power has been infilled the water. 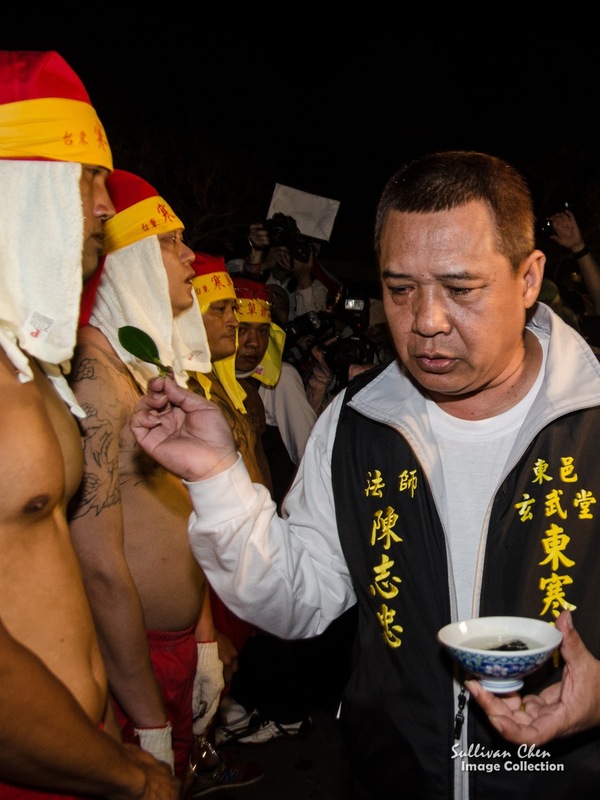 Then the Taoist priest throws the drops the clean water from the bowl toward the warriors with a banyan leaf. 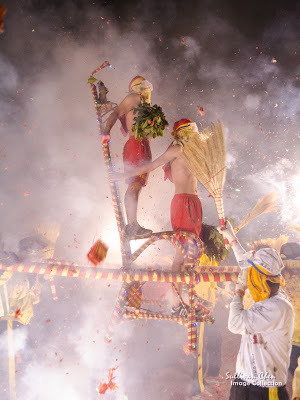 The climax of the rite is coming when the sedan chair rises with warrior standing on it. The sedan is carried by four men. Suddenly, the warrior becomes the target of paper firecrackers. The folks around throw paper firecrackers toward the warriors in the following 10 minutes without any pause. There are about 3 rounds of bombarding in each session. 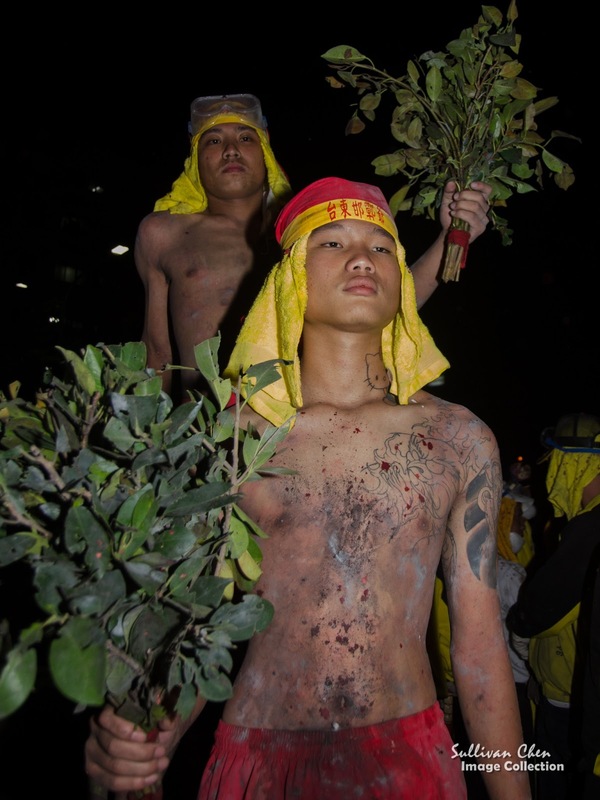 Paper firecrackers explore around the body of the warrior and the warrior uses only banyan branch to protect his face. Bombarded by paper firecrackers is like hit slightly by rubber bands. 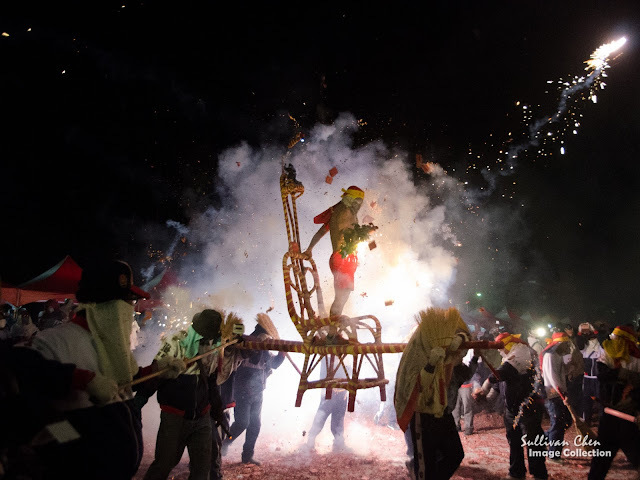 Although the power of paper firecrackers is weak, the sound and flash is astonishing, especial bombarded on the top of a wavering sedan chair. Taitung is located in the south east of Taiwan. There are some alternatives to go to Taitung. You can take aircraft or train from Taipei. The train take takes 5~7 hours from Taipei, and aircraft takes about 1 hour. You can booking the train ticket 14 in advance on the net or in 7-11.